Your source for quality used tires, winter tires, passenger and truck tires. 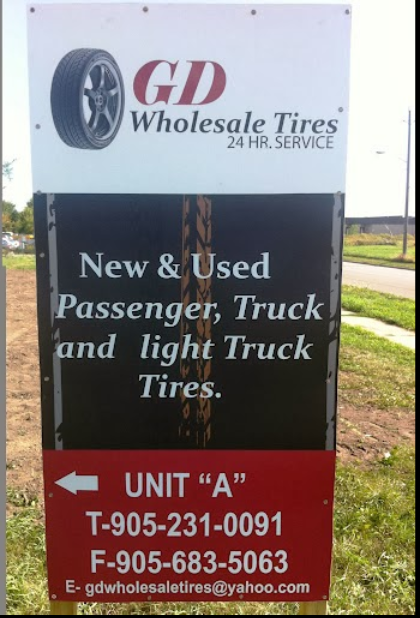 GD Wholesale Tires - Is an independent wholesale tire dealer that sells new and used passenger vehicle, light truck, and truck tires. The business maintains an excellent supply and is able to source availability for tires that are not currently in stock. The business also offers 24/7 truck roadside service assistance. At GD Wholesale Tires you’ll find new and used brand name tires at competitive prices. We maintain a great stock of many types of tires by leading brands for a wide range of vehicles. Buying used tires offers advantages. For many drivers, buying used tires is an ongoing practice. When buying from a reputable tire dealer, used tires can suit all of your requirements for safety and on-road performance, while providing substantial cost-saving benefits. One of the significant benefits of buying from GD Wholesale Tires as opposed to online Internet sources like eBay, is that customers can visually check the tires in person, so there’s no second guessing about a tire’s quality. Our own efforts at sourcing high quality used tires translates to time-saving, cost benefits for you! We’re also your one-stop shop for new tires. We stock major brands, including BF Goodrich, Dunlop, Firestone, Bridgestone, Goodyear, Michelin, Uniroyal, Yokohama, and more. GD Wholesale Tires strives to help you by providing first-rate customer service. If we don’t have what you need in stock, just ask us. We’ll do our best to source what you’re after. As well, you can be sure that we’ll help you select the best tires for your vehicle. Roadside assistance: GD Wholesale Tires also provides roadside truck assistance 24 hours a day, seven days a week. Please call our main number for more details. GD Wholesale Tires is your one source for the best tires at the best prices! We supply new and used passenger vehicle, truck, and light truck tires. The advantage of buying your tires from GD Wholesale Tires is that we handle all the sourcing for the best quality new and used tires. We welcome your calls! If you’d like to confirm details about tire types, size, pricing, and availability, contact us by calling 905-231-0091.